Canal Zone, the area of the Panama Canal was a US territory within the Republic of Panama around 10 miles wide with a total area of around 550 square miles. It came under US territory on November 18, 1903 with the signing of the Hay-Bunau Varilla Treaty. The arrangement was structured as a perpetual lease whereby the use, occupation, and control of the zone were granted to the United States. The Canal Zone ceased to exist on October 1, 1979 when a treaty between the two countries provided for joint jurisdiction. 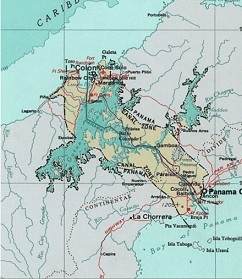 The Canal Zone reverted to Panama at the end of 1999. Canal Zone issued their own stamps while the area was under the jurisdiction of the US (1904 to 1979). Panama was a department of the Republic of Colombia before 1903 and as such stamps of Panama from the 1903 to 1906 time period were ‘Panama’ and surcharge overprints on Colombian issues. The first stamps of Canal Zone were ‘Canal Zone’ handstamp overprints on Panama issues from late 1903 and early 1904 (Scott #72, #78, #79 and varieties) which in turn were ‘Panama’ overprints on Colombian issues with ‘Colombia’ striked through. The first set of three stamps (Scott #1 to #3) is rare and sought after cataloging in the $1200 range for Mint and around $900 for Used. A number of varieties of the ‘Canal Zone’ handstamp/overprints and base varieties (strikethroughs and Panama overprints) exist and many of them fetch a premium. The overprints on Colombian issues generally fetch well into the 100s – one exception is a set of two overprints issued in 1906 (Scott #16 and #17) that go for a few dollars. Fake overprints also exist. ‘Canal Zone’ overprints on original issues of Panama were introduced in 1906 with the release of a set of five stamps that were overprints on part of the great men of Panama set (Scott #185 to #193). The set (Scott #22 to #26) catalogs for around $60 Mint and around one-third that for Used. ‘Canal Zone’ overprints on Panama issues continued through the period till 1924 and many of those issues are valuable. Some of the overprint varieties (example Scott #45 to #48 – Type III – thin letters, non-centered overprints that fetch into the 1000s) from the period are very rare and extremely valuable. A long set of twelve stamps released between 1924 and 1925 that were ‘Canal Zone’ overprints on part of a United States set (Scott #551 to #573) from the period. The set (Scott #70 to #81) catalogs for around $550 Mint and around $300 for Used. Overprints on United States issues continued through the period till 1928. Original issues of Canal Zone debut in 1928 with the release of a long running set that continued through 1940. The set (Scott #105 to #114) is inexpensive cataloging in the $5 range for Used and a slight premium for Mint. The set featured head portraits of Major General William Crawford Gorgas, Major General George Washington Goethals, Major General Harry Foote Hodges, Lt. Col. David D. Gaillard, Major General William L. Sibert, Jackson Smith, Read Adm. Harry H. Rousseau, Col. Sydney B. Williamson, and J.C.S. Blackburn. The set also features an image of Gaillard Cut, the artificial valley that cuts through the continental divide in Panana – part of the Panama Canal area, it was the most significant landmark of Canal Zone. A long set of sixteen stamps released on August 15, 1939 to mark the 25th anniversary of the Panama Canal. The set (Scott #120 to #135) catalogs for around $120 Mint and around $90 for Used. The set features before and after images of significant areas of the Panama Canal – they form a great tribute to one of the greatest engineering feats. The designs show before and after images of Balboa, Gaillard Cut, Bas Obispo, Gatun Locks, Canal Channel, Gamboa, Pedro Miguel Locks, and Gatun Spillway. A stamp released on October 12, 1962 to mark the opening of the Thatcher Ferry Bridge (now called the Bridge of the Americas) which spanned the Pacific entrance to the Panama Canal – until the opening of the Centennial Bridge in 2004, this bridge was a key part of the Pan-American Highway. The issue (Scott #157) is inexpensive cataloging for well under a dollar. The issue is significant because of the existence of an error variety (silver omitted) that catalogs for around $8K MNH. Canal Zone used United States coins and paper money. The Palo Seco Leper Colony established in Balboa within the Canal Zone issued a few tokens worth $1.8K. Part of it was destroyed in 1955. The issues denominated from one cent to a dollar (1c, 5c, 10c, 25c, 50c, and $1) had square or circular holes in the middle and were made of Brass or Aluminum. They were backed by US currency and were replaced by US coinage. The issues are very rare and sought after, especially in higher grades. They catalog for upwards of $130 in F.
Popular items from the Canal Zone include US defense patches, original photographs, and other historical memorabilia.